Looking to take your curb appeal to the next level? Then check out this list of garden gates that will have all the neighbors talking. In a good way. Curb appeal is all about making a good first impression. Whether you’re trying to sell your home or are happy where you are, most of us want our home to make a good first impression. Nobody sets out to live in the dumpiest house on the block, right? But, have you ever thought about how a garden gate can affect a home’s curb appeal? Once upon a time, I worked for an architectural firm whose primary client was a large housing developer. This company specialized in the stereotypical tract housing project: two hundred new homes based on five floor plans, which were roughly the same size, shape and style, and located on curvy streets with cul-de-sacs. They were nice homes, but the neighborhoods were a bit bland because everything was so similar. One of my jobs was to coordinate the sales details (checking that a particular plan would fit on the site the buyer wanted, for example) and drawing a site plan for that sale. It wasn’t terribly exciting because the builder provided the same site improvements for every home: a driveway, sidewalk, small concrete patio, and six foot tall wooden privacy fence with one plain garden gate next to the garage. It can be really difficult to have curb appeal when your house looks like every other house in your neighborhood and everybody has the same fence and garden gate. If you live in a neighborhood like I described, an easy option to add curb appeal is to replace your garden gate. It doesn’t need to be especially fancy or expensive. It just needs to have some character with details that add visual interest. 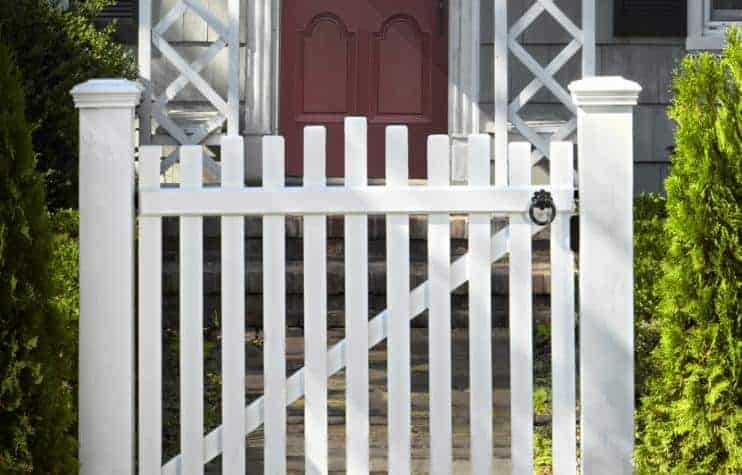 I’ve rounded up fifteen different garden gates that can differentiate your house from all the others and boost your home’s curb appeal. 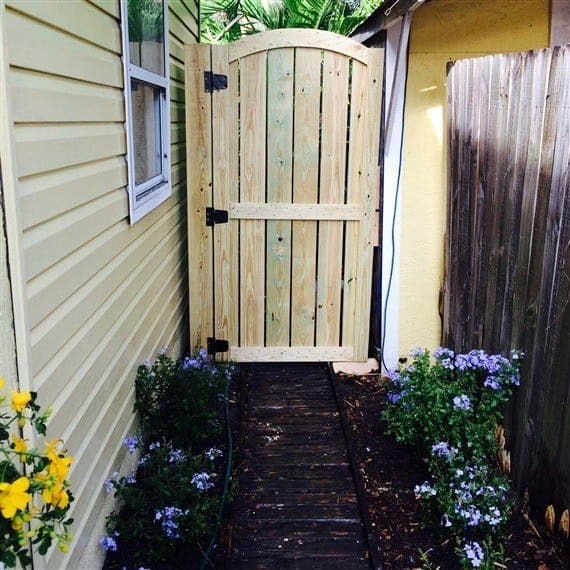 I like this Pacific Gate Works – Rose City Wooden Side Yard Gate. It’s unfinished Western Red Cedar; so not only will it last, you can decide how to finish it. The arch provides some nice character. The Pacific Gate Works Signature Style Gate looks like it belongs inside the house, doesn’t it? Pretty, pretty. 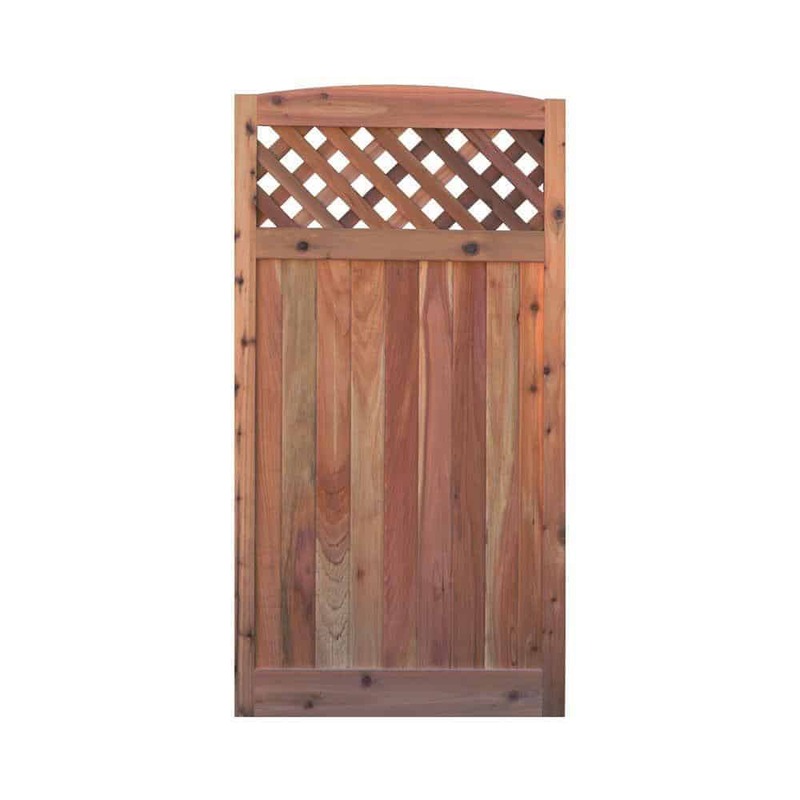 This Cedar Arch Lattice Gate is a nice, simple gate that you can get at Home Depot, yet it looks very nice and would definitely add some curb appeal. The Yardistry Gate with Faux Glass Inserts is an interesting option. For a more modern take on the garden gate, take a look at Yardistry Gate with Black Baluster Inserts. It’s pre-stained in light gray. 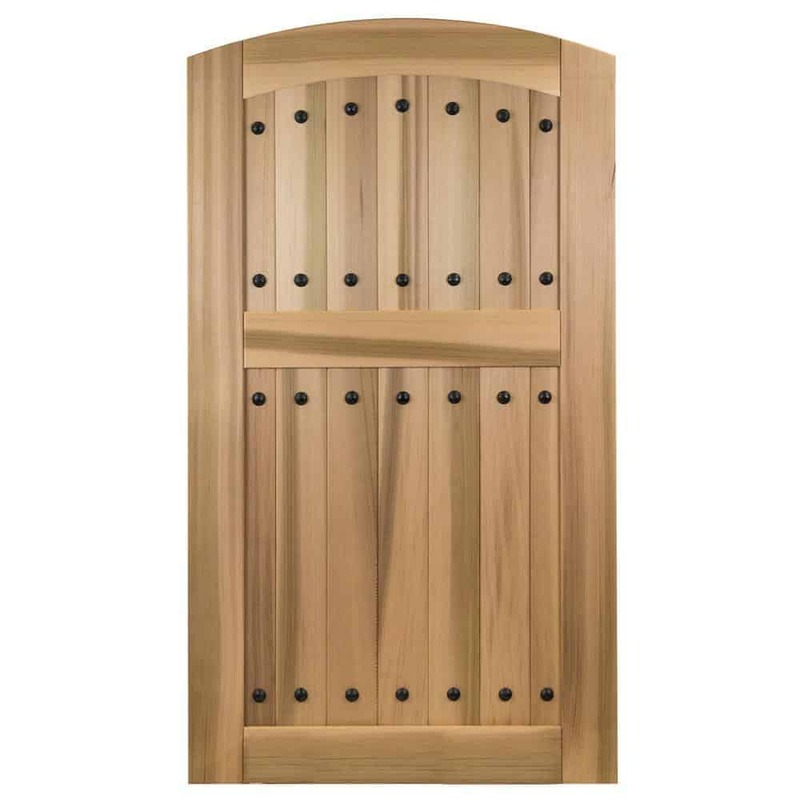 The Signature Development Arch Top Red Cedar Gate is a very stylish option, that’s available at Home Depot. It looks very nice when paired with the coordinating fencing. I think the Hacienda Solid Cedar Wood Fence Gate is my favorite. The buttons are called calvos, which is Spanish for nail or spike. Wood gates are really nice, but there is definitely something to be said for a vinyl gate. Depending on your house style, a white gate might complement the house more than a stained wood gate. But, the real value is in it’s low-maintenance. This WamBam Traditional 6’x4′ Premium Vinyl Arched Vinyl Gate has a lifetime warranty against yellowing, cracking, splitting or warping. If you don’t like to do home maintenance, this is the gate for you. Wrought iron fencing is always a classic look. This Aleko Munich Style Iron Wrought Pedestrian Steel Gate would definitely boost your curb appeal. You can also find vintage cast iron garden gates on eBay to add some real character and style. Or check out your local architectural salvage for hidden treasures. This Old House provides instructions for a quaint wooden garden gate. Pair this with the quintessential white picket fence, and your house will just ooze curb appeal. How A Girl Built A Gate did a great job with her gate. Love the inset grille! It makes you think there’s probably some kind of magical garden on the other side. I like this gate from Canadian Woodworking & Home Improvement. Rather than inserting a grille, they chose a stained glass panel (which would be great at hiding your yard, if it’s not so magical). Black & Decker’s Building a Fancy Wooden Gate in One Day makes it looks so simple and pretty. I’m beginning to think I have a thing for arches. 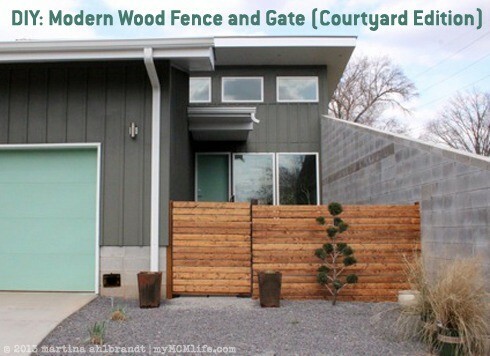 If you’re looking for something more modern, try this DIY Modern Wood Fence and Gate (Courtyard Edition). 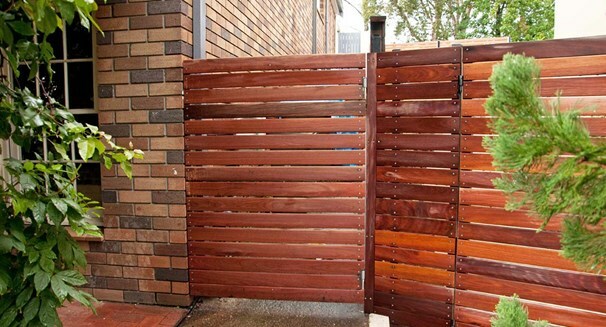 The Better Homes & Gardens Australia Modern Gate is another modern fence that looks great. What do you think? Is a new garden gate in your future? I love that one with the inset grill but I’m also really into the horizontal gates and fences lately. They are kinda interesting. Completely agree – I really like the look of the horizontal fence and gate.